A toboggan is basically a sled that’s mostly used for sliding down snowy and icy slopes at great speed, and can be great fun – especially for kids who like the thrill of the high speed descent into snow, and don’t seem to mind falling out of the sled and getting covered in snow too much!Tobogganing is often seen as a competitive version of sledding. What is the Difference Between a Sled and a Toboggan? Sleds and toboggans are both used to transport people on snow or ice. Sleds and toboggans are both used in winter games and tobogganing is a competitive sport. A sled is basically a flat surface with runners or rails. The runners, glide along the snow. Downhill sledding needs no power, but cross country sledding often uses dogs to pull the sled along. A toboggan is like a sled that has a turned up front! Traditionally they were made from wood, and they have no runners. 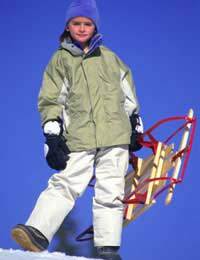 Toboggans have limited steering and tend to career downhill or along specially designed toboggan runs – while sleds can be steered from the inside. The sport of tobogganing involves steering a metal toboggan down a metal half tube which curves around corners at speed. Tobogganing has become a popular sport with people on winter sport holidays, and there are facilities at a lot of resorts for people to try their hand at this exciting sport. There are training slopes available for younger participants, as well as big slopes (or tracks) that can be up to a kilometre long, designed for racing and experienced tobogganers. In some Austrian resorts, tobogganing has become so popular that there are 10 kilometre long toboggan tracks, and even floodlit tracks that can be used at night. What Equipment do You Need for Tobogganing and Sledding? Tobogganing can be tough on you, especially if you fall off! Wear some hard wearing clothes like jeans or heavy cord trousers, and a make sure you have a warm jacket. It’s a good idea to also wear ski-gloves and goggles. You can usually hire any extra equipment you’ll need from the resort, so ask advice when you’re booking the activity. Sledding needs winter clothes but they don’t necessarily have to be as hard wearing as the clothing you would wear for competitive tobogganing and racing. It’s a good idea to make your clothes warm and waterproof though as you’ll possibly find yourself spending a lot of time face down in the snow! What is Sledding all About? Sledding is really considered to just be different form of tobogganing, a winter pastime usually enjoyed by children and people wanting to have some fun in the snow. There are many variations on sledding – some involving being pulled by dogs through cross country terrain, and some often referred to as ‘sleighing’ that tend to involve bigger sleds and bigger animals such as horses, or even reindeer! Sledding and tobogganing are great fun, but can lead to nasty accidents if you’re not careful. If you’re thinking of taking a chance on a toboggan run, take it easy on your first run, and build up speed gradually.